“Today,” he began, “is the Day of Miracles, celebrated as part of the Great Prayer Festival that has been held in Lhasa for almost 600 years. It commemorates an occasion during the Buddha’s life when he defeated other ascetics in a display of miraculous feats. “Gods or human beings, we all want to be happy and the root of happiness is in the mind. Liberation may take some time, but we can all find peace of mind if we pay attention to it here and now. Even animals, when they are not in danger, remain relaxed and at peace. What makes us upset is anger, fear and suspicion. It’s the unruliness of our minds that makes us unhappy. The ancient Indian traditions saw dealing with mental afflictions as more important than cultivating sensory pleasure. The Buddhas don’t wash away misdeeds and mental afflictions with water, they show us how to understand reality as it really is—that is how we can overcome them. 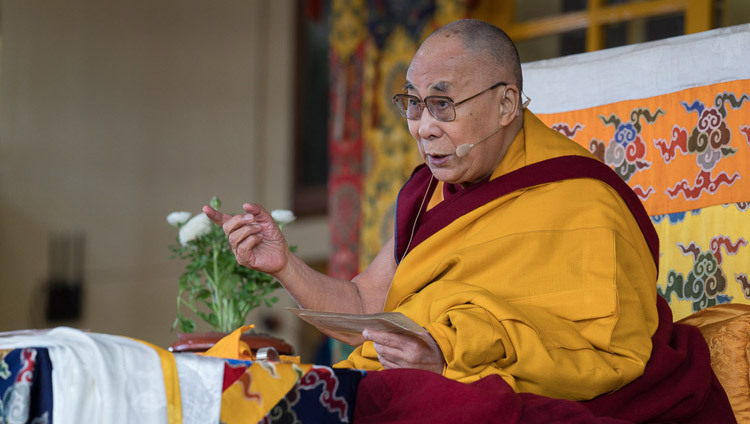 His Holiness explained that the Buddha did not teach immediately after his enlightenment because he reflected that no one would understand what he had realized. In due course, however, he taught the nature, function and results of the Four Noble Truths. We cling to the appearance that things exist independently, he said, a distorted view that the Buddha countered by use of reason. Human nature is compassionate, rooted in the love our mothers show us, without which we would not survive. And yet the world is rife with conflict and problems, which occur when we are overwhelmed by anger and attachment. Secular education based on universal values can help us better understand the flaws in this. On the other hand, the Buddha taught that we can put an end to karma and mental afflictions by challenging our view of true existence through meditation on emptiness. “We need to know who the Buddha is,” His Holiness continued, “which doesn’t mean being able to identify the major and minor marks of his body, but coming to understand his teaching. The more we familiarize ourselves with his teaching, the more we appreciate how scientific it is. “The Buddha taught different things to different groups of people at different times. He first explained the Four Noble Truths. In the second turning of the wheel of Dharma he explained the perfection of wisdom, and in the third turning he taught about Buddha nature. The Four Noble Truths included a rough account of selflessness, which the perfection of wisdom explains more subtly. In the ‘Unravelling of Thought Sutra’, part of the third turning of the wheel, he clarified that he taught according to his listeners’ different mental disposition. Noting that the tradition for commemorating the Buddha on this day includes reading one of the Jataka Tales, the stories of the Buddha’s previous lives, His Holiness observed that the collection was compiled by Aryasura, also known as Ashvaghosha, a student of Aryadeva who was the disciple of Nagarjuna. Today’s story concerned a noble, selfless hare, who lived in the forest where he led other animals, an otter, a jackal and a monkey in particular, along the path of virtue. After reading the opening of the Jataka Tale, His Holiness annnounced that he would also like to read Je Tsongkhapa’s ‘In Praise of Dependent Origination’, transmission of which he received from the Kinnauri Lama, Rigzin Tempa. It begins with a verse of homage to the Conqueror who saw dependent origination and taught it. It is on the basis of this that we can overcome our distorted view of reality that is the root of our mental afflictions. These mental afflictions, His Holiness stressed, are not of the nature of the mind. He remarked that the perfection of wisdom teachings of the second turning of the wheel deal with the emptiness that is the object clear light, while the third turning of the wheel refers to the subjective clear light, the subtle mind that is used to realize emptiness. This mind of clarity and awareness is the basis of the practice of tantra. All Tibetan Buddhist traditions stress the importance of understanding the nature of the mind. As His Holiness read through the verses he paused to clarify and observe. Understanding dependent origination helps us overcome ignorance, the first of the twelve links of dependent origination, which can involve not understanding the law of causality, or ignorance of how things are. He observed that ‘dependence’ counters the extreme view of eternalism, while ‘origination’ counters nihilism. We know things exist because they affect us, but they only exist by way of designation. In clarifying dependent origination His Holiness mentioned that a result exists in dependence on its cause, but we can also say that something is only a cause because it has a result. There is a similar relation between a whole and its parts. “Even after the political fragmentation of Tibet, the Kangyur and Tengyur collections were a source of unity and harmony. They were found and revered in all three provinces of Tibet, as well as adjacent lands like Mongolia and Ladakh. Although I am not very highly educated, I can appreciate that there is knowledge in this literature that can contribute to a wider conversation. For example, the quantum physics view that things have no objective existence resonates with the views of the Mind Only School. The difference may be that in our tradition we try to use our understanding of how things are to transform the mind, which quantum physicists may not do. 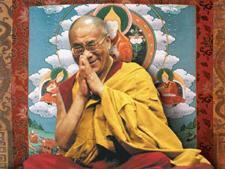 Dedication prayers were recited as His Holiness descended from the throne. He then walked back to his residence, greeting friends and well-wishers in the smiling crowd on the way.